Mapped from DEP Wetlands data: coastal bank, bluff, or sea cliff, barrier beach system, coastal dune and barrier beach–coastal dune. 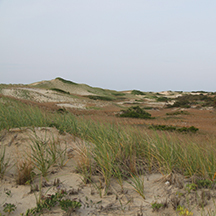 Coastal uplands include headlands, bluffs, sea cliffs and coastal banks, as well as sandplains and coastal dunes (rounded hills deposited and sculpted by wind and waves). Also included are coastal grasslands and heathlands (areas characterized by low-growing shrubs mixed with grasses and forbs).